This is where we discuss figure skating and skating related items. How did you favourite skaters perform, and so on? However we never speculate on the private lives of skaters, like who might be going out with whom, because that is poison and is not tolerated here. A good guideline is that if it's not publicly announced, in the papers etc. then it's probably best to leave it alone. Is it a gray area? Then write to me and ask. I noticed some very tired looking skating yesterday......from almost everyone. Olympic burn-out seems to be a very real thing this year. What a travesty for the pairs. It really makes me wonder what *could* have happened if Luba & Dylann were there. Glad to see Gabby come back strong - I think she was undermarked (though maybe not if there was an edge call), and Katelyn is still very much in the mix for Bronze, or even silver if Carolina has a weak free skate. She has a pretty huge lead though, so it looks like the podium is a guarantee for her. Wow - this really is turning into a bizarre event. It seems there are more withdrawals then I ever remember. I'm really concerned how this will play out for some countries, and their chances to secure spots for next year's Worlds. The spots for 2019 Worlds will definitely be something to watch, Kevin. Several of the withdrawals seem to be due to stress fractures/similar injuries, not just the usual post-Olympic fallout. Yes, I'm thinking of Canada at the moment. Can someone explain to me what happens with the 3rd skater's placement if really low affects the spots for the next worlds? Ok, for example Larkyn...she didn't qualify for the FS and was 25th, so how will this enter into the overall points for Canada's ladies? I enjoyed watching the Men's SP this morning, although I did not watch until 7:30 a.m. or so. I don't have the same stamina as you Elizabeth. I'll have to watch the first 4 flights later. Btw, the quote within a quote is now working automatically...thank goodness. Qualification of spots for next year is only based on the placement of the top 2 skaters, even if there are 3 competing. If there are only 2 skaters/teams competing and one does not qualify for the free skate - the one that does must finish in the top 10 (except in pairs) or the top 11 (in pairs) to maintain 2 spots for the next year. The "magic number" is 28 or less - those who don't qualify for the free skate in men, ladies or dance automatically receive 18 points; in pairs they receive 17 since only 16 pairs go forward to the FS. This also applies if there were 3 skaters/teams competing and only 1 qualifies for the free skate, since only the placement of the top 2 skaters counts. The "magic number" for 3 spots is 13 or less if there are 2 skaters whose placement counts. Different rules apply if there is only 1 skater/team competing. Each national federation is entitled to send one entry per discipline. Depending on their results at the previous year's competition, some countries are allowed to send a second or third entry. If a country has only one entry, that skater/team must place in the top ten to earn a second entry and in the top two to earn three entries to next year's championships. If a country has two or three entries, their combined placement (best two) must be 28 or less to keep two entries for their country, and 13 or fewer to qualify three entries. All skaters who qualify for the free segment but place 17th or lower receive 16 placement points. All skaters who compete in the short segment but do not qualify for the free receive 18 placement points. Entries do not carry over and so countries must continue to earn their second or third spot every year. There are exceptions if a skater is forced to withdraw in the middle of the competition due to a medical emergency or equipment problems. Last edited by Elizabeth on Thu Mar 22, 2018 12:43 pm, edited 1 time in total. Thanks Elizabeth! I feel better now! "I’ve been struggling with an ankle injury for the past couple of weeks so it has been difficult and this was our first full run through since the Olympics. The key for us (for FS) will be to stay focused and present in every moment." When Paul Martini asked her about the "emotion" at the end of the program, she admitted to being in pain and spoke about the injury. They are currently on the ice for the warm-up of the 2nd group of pairs in the FS - they will skate last in the group. I was thinking the same thing Kevin. I felt badly for the Knierim's. It was clearly Alexa's difficulty with not being strong enough or not enough stamina. I'm sure the digestive problems she was having finally caught up with her after this grueling season. She is fortunate to have such a supportive husband in Chris. They've had one heck of a couple of years! From wiki: "Alexa Scimeca Knierim became sick in April 2016, and her illness interrupted the Knierims' training throughout the summer months. She was properly diagnosed with a rare, life-threatening gastrointestinal condition in August and underwent two abdominal surgeries that month. The pair resumed light training in late September. Scimeca Knierim underwent additional surgery on November 1 and returned to training by the middle of that month. Scimeca Knierim's illness involved regular episodes of vomiting, debilitating pain, difficulties with sleeping, eating or drinking, as well as significant weight loss. Already small, she lost 20 pounds and shrunk to just over 80 pounds. 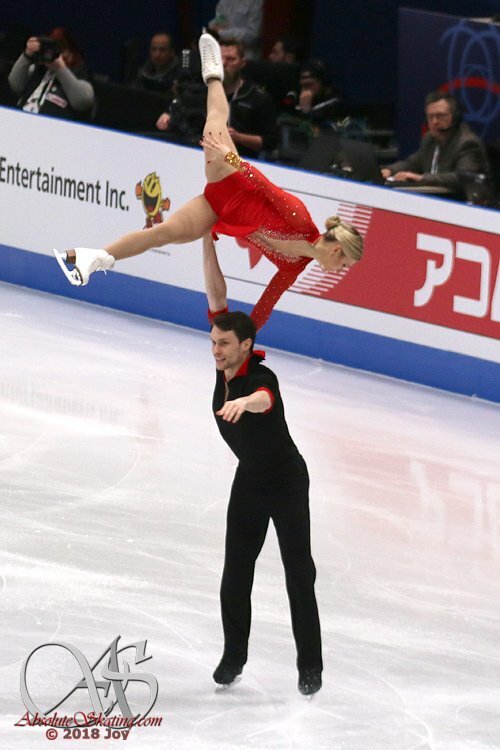 Knierim stated that when his wife initially returned to the ice following surgery, she had to hold his hands just to skate around in circles and could only skate for 10 minutes before having to go home for a nap because it was so physically draining. The pair withdrew from both of their Grand Prix events, the 2016 Rostelecom Cup and 2016 Cup of China, and the 2017 U.S. Championships. 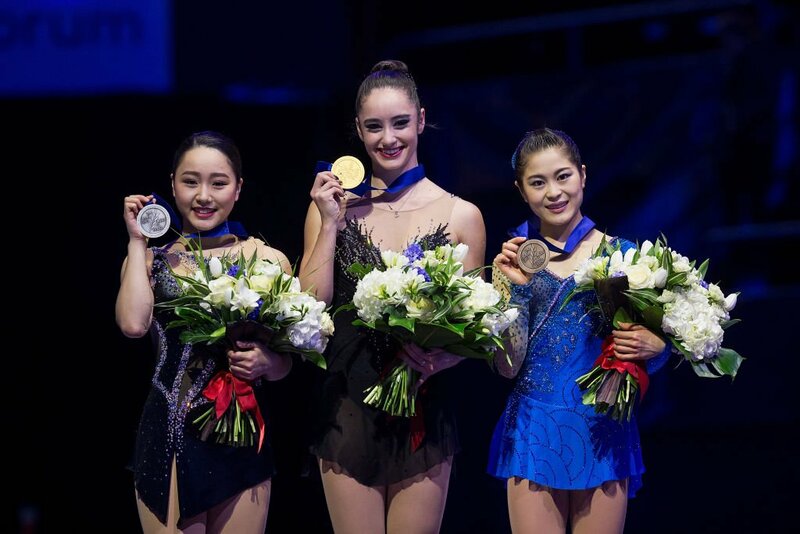 They resumed full training in January and were named to the U.S. team for both the 2017 Four Continents Championships and the 2017 World Championships." She looked decided unwell yesterday but it may not have been anything to do with her previous problems. One well-known US reporter took to Twitter to criticize them, and all US pairs, suggesting that they shouldn't even "bother". His posts were not well received! The short dance is underway with the top 20 out of the 31 couples set to qualify for the free dance. The CBC live stream is excellent. Four more groups to compete, with the other two CDN teams in group 6 & 7. South Korea's Dabin Choi withdraws from FS @ #WorldFigure - her right skate boot is broken. "The boot was already weak when I got here. I have been taping it, but it finally gave way at the first practice. In SP I felt the boot gave no support and I am afraid of risking injury." Uhm.......OMG!!! Don't miss the women's event!! You can say that again and again!! And she led her two fellow medalists in a victory lap before going to the cameras. ( good for her). But she didn't see the carpet at the end of the ice put there for the flag raisers and ended up falling and wrapping herself in the large flag she'd been given. Her fellow medalists helped her up and we all had a good laugh after crying while singing "O'Canada". We saw some awesome skating tonight but lots of splats too. Rink was full. 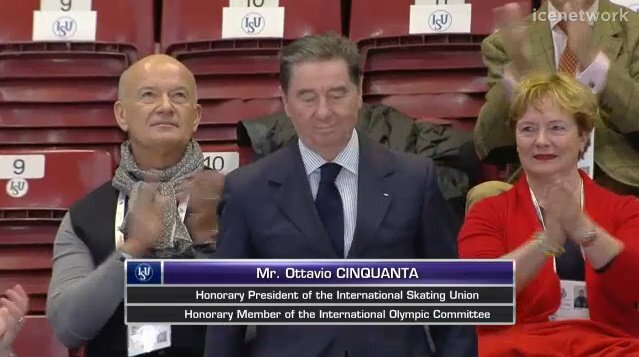 Although the final results of the ladies FS had not yet been shown on TV across Canada, obviously Judy is in Milan and has "spilled the beans". Last edited by Elizabeth on Sat Mar 24, 2018 12:02 pm, edited 2 times in total. Last edited by Elizabeth on Sat Mar 24, 2018 7:45 pm, edited 1 time in total. Tomorrow we move on to the final day of competition - first the free program for the men and then for the ice dancers. Drew Wolfe and Alex Kang Chan Kam were not on practice yesterday. The pairs short program is tomorrow. Luckily, there are boot and blade folks onsite, but geez. Hope this gets "sorted" QUICKLY! According to some sources, Alex's partner has her skates but no luggage. Edea is providing Alex with skates. They may have to skate in rented black leotards. Didn't Carolina Kostner lend her an outfit to wear? I think that's what I heard. Well, what an exciting night! I was so happy about Kaetlyn winning the gold. Thanks for your perspective Judy. It must be so cool to be there! I couldn't tell what she tripped on, but Elizabeth filled me in before I read your post. 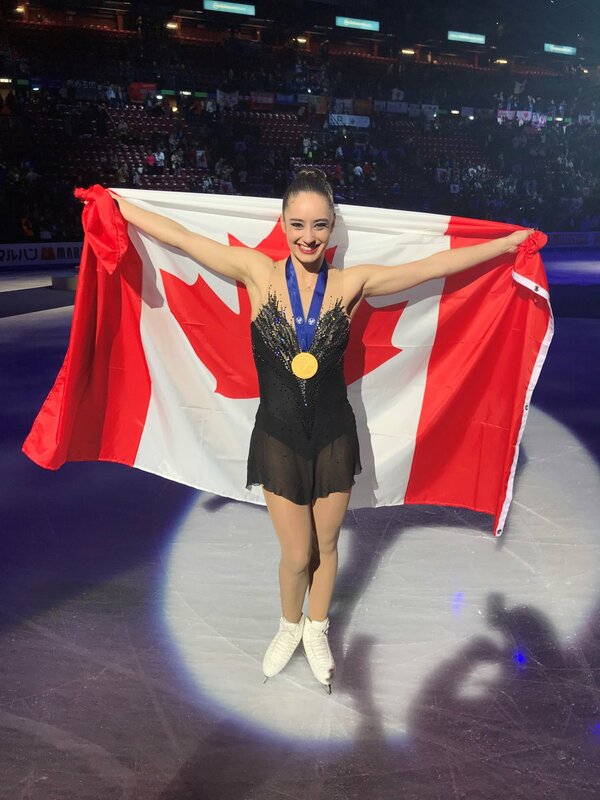 I think Kaetlyn's consistency and the fact that she is a very balanced skater won it for her. If you look at her technical and program component scores they are very equal. I don't approve of skaters doing all their jumps at the last half of the program to get more marks. "Putting your eggs on in one basket" can be risky and I do believe it backfired on Alina Zagitova today due to fatigue, Olympic burn-out or whatever. It made one feel sad to see how disappointed she was. She's young though and so consistency is more difficult I'm sure. It looks like Gabby sprained her foot or ankle based on how she was rubbing it and her hint of injury during the post-competition interview. Wow, that poor Russian skater didn't have a chance sandwiched between the two Canadian girls....j/k of course, but it's nice to have two women from Canada at the top. I remember Karen Magnusson winning the gold, but we heard about it later due to the time difference. I then watched it in the evening. I was only 12 almost 13 at the time and now I'm almost 58 to put things in perspective. If you are referring to Camille Ruest, it was actually Kirsten Moore-Towers that loaned her an outfit to wear. They are are "training mates" in Montreal.